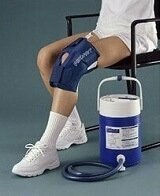 Using ice treatment appropriately can help to reduce knee swelling and pain. Cooling the tissues with ice reduces blood flow to the area, helps to numb pain and can speed up healing. The medical term for using ice to treat injuries is cryotherapy treatment. 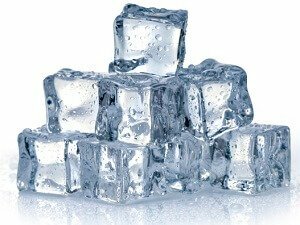 Ice can be useful after injuries, with longer term problems, especially during flare-ups of conditions such as arthritis and after knee surgery. So how does Ice Treatment work? With an injury, swelling accumulates in the affected area which causes two problems. Firstly, there are chemicals in the fluid that aggravate and irritate the nerves fibres causing pain. Secondly, the pressure from the swelling (there is limited space in each joint) causes pain and limits the amount of movement that the joint can perform e.g. how much you can bend and straighten the knee. Ice treatment can help in two ways. Firstly, the cold from the ice has an analgesic effect which reduces pain. Secondly, it helps to reduce the amount of bleeding into the joint and soft tissues thus reducing swelling and any associated muscle spasms. Cryotherapy treatment is therefore an important and effective treatment for soft tissue injuries such as a knee sprain or muscle tear. Ice treatment works most effectively when used immediately after an injury or surgery (in the first 3-4 days), but can also help reduce pain and inflammation in longer term knee problems. 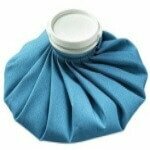 The simplest way to apply cryotherapy treatment is to wrap some ice in a damp cloth e.g. tea towel. Place a dry cloth on the affected area and then apply the ice for 10-15 minutes. Do not leave the ice on any longer as it can cause an ice burn. It can also slow blood flow so much that the good nutrients needed for healing can’t get in and the bad chemicals produced from the injury can’t get taken away. Also, if the body gets too cold it responds by causing the blood vessels to dilate (open more) allowing more blood to rush into the area which actually increases swelling. This is known as the Hunting effect. Remove the ice for at least 2 hours before reapplying to allow the area to return to its normal temperature. Use cryotherapy treatment frequently to maximise the effectiveness. This two minute video from ToHealth talks about how and when to use cryotherapy treatment safely following an injury to aid healing. There are a number of different ways to apply ice treatment. Simple yet effective! Peas often work best as they mould best to your shape. Just don’t eat them! Instant ice packs are great if you are out and about or don't have access to a freezer. 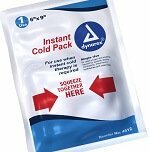 Simply squeeze the pack to activate and you will have an instantly cold pack to use. Cryo cuffs are frequently used after surgery or by athletes. The cryo cuff system keeps the ice pack cold for long periods. Fill paper cups with water (filled to the top) and freeze. Place the ice directly on to the skin and keep it moving to prevent an ice burn by drawing circles/patterns on the affected area. As the ice melts, fold back the sides of the cup to continue to expose the ice. To find out more about the different ways to apply ice, visit the ice wraps section. Ice treatment is a key part of PRICE treatment (Protect Rest Ice Compression Elevation). To find out more about the best ways to apply cryotherapy treament, visit the ice wraps section. Alternatively, visit the knee treatment section to find out about other treatment options.